So easy to make and delicious! Try adding a little grated cheese on top when serving. Lovely with some crusty home made bread. Hi there would just like to say my partner has just made your hot cucumber soup, from our very own home grown cucumbers and it was delicious. So easy to make and delicious! we like to add cheese when serving + home made bread! I’ve just made this soup and put it through a blender at the end. Also added a couple of cloves of pressed garlic, a little salt and ground black pepper. Delicious. Delicious! Have just made a batch of this soup with a little extra black pepper as recommended by previous posters. Only discovered this site a few days back, but I have a feeling I’ll be cooking a lot of the recipes here! Lovely soup, I make soups all the time, I grow my own vegetables, and do not waste anything, leftovers go into blender with stock cube etc. but instead of cream, I use phily cheese, different flavours for diff. soups, and as I am a vege, it gives me a litle protein as well. My cucumber plant looks like a trivid at the moment. OOOOOOH BOY!! Just made this a and it’s delish! Not going to be too many “spare” cucumbers this year. Thanks Folks. Will dig out a couple of my favourite recipies to post in return. Love this website,only started gardening again this year and it`s an excellent site to pep up old ideas and learn new ones! Great recipe, tastes delicious. I added fresh mint leaves and a little chopped green chili. Will definitely be making more. We had this soup for tea tonight and it was lovely. A really fresh summery taste. I added a bit of fresh mint and black pepper. I thought a might add a few fresh peas next time. 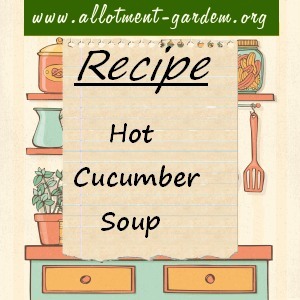 I just made this soup tonight after my mum bringing me plenty of cucumber from the garden. I added salt and pepper and plenty of garlic plus two chicken stock cubes and a vegetable one along with some peas. Blended it up then added some (not alot) clotted cream which gave it this amazing creamy taste to it. Brilliant recipe and so so simple too. This was great the kids even liked it. We’ll being doing this again. I made similar recipe with celeriac and potatoe and onion and a clove of garlic .. all chopped up. Then added salt, pepper, chicken stock, nutmeg, ginger, worcester sauce and mild chili.. kept tasting to make sure it was good the extra pinch of salt got it right!!! This soup is so good, made extra large pan full, had it hot first day, next day had it cold from the fridge with a little yogurt drissled over top. Will be making another batch to freeze for the winter as this year we planted an old variety called Fagusha (not sure if spelling correct). Lots of large, very crisp cucs that last a good while in the fridge, and don’t wilt. Could someone tell—does the cucumber require peeling? I’m not a lover of cucumber but we had so many this year in the veggie plot I needed ideas as to what to do with them. (Other than feed them to the pigs). Well, who knew cucumbers could taste so good when made into a soup. This is a delicious recipe and I’m totally converted! Thank you! Lovely soup. I got mine in my veggie box and looked for a recipe to use it up. Love the idea of using Philly to add protein. Will certainly use in the future. I’m just going out to buy cucumber and Philly. Sounds great. You are bookmarked AG. I’ll be back, and back again. Looks simple and fairly quick and it is but the taste is complex, rich and gorgeous. My husband adds cheddar cheese. I add double cream to mine although it is not really necessary. No need for complicated recipes.